Representative Honours: Ireland: 17 Full Caps / 5 Goals (1933-1947), 3 War-Time Caps / 1 Goal (1941-1944), 1 Victory Cap (1946); Irish Free State/Eire: 7 Full Caps (1932-1948), Junior (1931); Wales/Ireland XI (1935). Club Honours: (with Dolphin) Irish Free State Cup Runner-Up 1931/32; (with Rangers) Scottish League Champion 1933/34; (with Everton) Football League Champion 1938/39. Diminutive inside-forward Alex Stevenson proved the old saying - “the player who is good enough is big enough.” He stood just 5’ 5” and weighed little over 10 stone but he built a successful career playing in the higher echelons of both the Scottish and English Leagues utilising his "rare box o'tricks" from either the left or right of attack. Stevenson started out with Dolphin in his native Dublin, earning his first cap for the Free State as a nineteen year-old in May 1932. His performances alerted Rangers who brought him to the professional game in August 1932. He spent just a season and a half at Ibrox, during which he played his first match for the IFA and played in two championship winning seasons. Although he made just twelve appearances in the Scottish League, he managed seven goals and he developed a reputation as a highly intelligent player. Signed by Everton for £37,000 in January 1934, he made his debut against Arsenal on 3rd February. 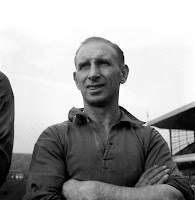 Described as “nimble as a mountain goat” and renowned for his ball-juggling skills, during his time at Goodison Stevenson was a great ‘supplier’ to goalscoring legends Dixie Dean and Tommy Lawton and regular net-finder himself. Also part of the Toffee’s attack at that time was international colleague, Jackie Coulter, with whom he formed an excellent understanding on the left-wing. In 1938/39 Everton picked up the final League title before the outbreak of the Second World War, Stevenson scoring 10 goals in 36 appearances. During the War years Stevenson served with the RAF while continuing to appear regularly for Everton and occasionally as a guest for other Lancashire/Merseyside clubs. At international level Stevenson was part of an excellent inside-forward partnership with Peter Doherty as Ireland went through a period of relatively consistent results, with Stevenson’s name regularly appearing on the score-sheet. After the War he appeared in a Victory International against Scotland and was one of just a handful of players who returned to the Full Ireland side when the British Championships resumed after eight years. He also re-established himself in the Eire team after a fourteen year absence, making his final international appearance at the age of 36. A regular in the Everton side right up to his final League appearance on 7th May 1949. He continued to pull on his boots for a number of seasons with Bootle and remained involved in international football as manager of the Republic of Ireland from 1953-1955. Summary: 17/5. Won 6, Drew 2, Lost 9. Summary: 4/1. Won 1, Drew 0, Lost 3. Summary: 7/0. Won 2, Drew 0, Lost 5. I only found out recently that Alex was my gran's cousin.Being an evertonian makes me doubly proud to have a connection to a legend. I am Alex Stevensons Daughter, I am so proud to see there is so much about my dad! i only found out tonight that there was an Everton website and cant believe how much there is about him. I was born in 1955 so my dad had finished his football days, but i have one of his gold medals which i will treasure forever and my brother has about 6 of his international caps. I am proud to be his daughter. Alex Stevenson was my Dad's brother. I have always been very interested in reading the write ups about my Uncle Alex, as I remember him from my childhood. My father had a picture of him surrounded by his international caps. By some bizarre and surreal coincidence, I'm related to everyone in this blog. Alex Stevenson was my great uncle. That makes BootleBlue my 3rd cousin, KKelsey my 1st cousin once removed, and Alex Nee Stevenson, you must be my mum! Hi Alex Stevenson was my uncle. My mother, Mabel, was his sister. She was always talking about him and we are all very proud of his achievements. I am still living in Dublin, not too far from where Alex was raised in East Wall. My grandson is named Alex. Hi do any of you know whether Alex Stevenson was a Catholic or protestant? The Everton encyclopaedia claim he was ;the last Irish Catholic to play for Rangers;, but this could have just been because he played for Eire. I have spoken to a 92 year old member of the Orange Institution, in Bootle, who claims that Orange Stevenson was in his lodge.